I find the system of loyalty cards quite problematic. Often, I must confess, I quite simply just don’t get the point. 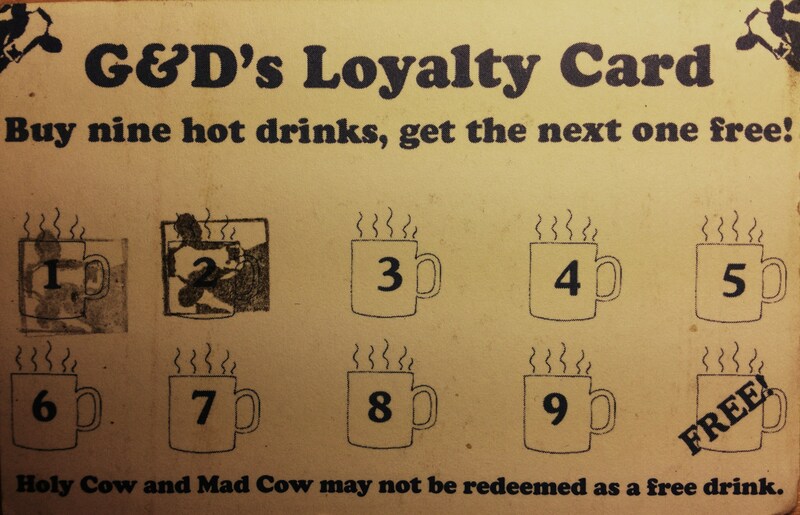 Bear with me one moment as I open my wallet… I find a veritable cornucopia of loyalty cards: Missing Bean (6/8), G&D’s (2/9), Caffe Nero (2/9), Taylors (7/9! ), Java & Co. (5/9), another Missing Bean (4/8), TSK (1/10) and The Oxford Café (2/3). They form a small pile in front of me. A Tastecard, Union Card, a Circuit Laundry Card, a Donor Card and a Bank Card lie with them. On reflection though, as they lie there with the cumulative potential of 10 free coffees (you know, those large cappuccinos with gluttonous syrups, or deluxe, marshmallowed hot chocolates), and my caffeine-riddled brain begins to perceive things once more with a refreshing novelty, the concept suddenly seems one massive, mutually agreed-upon lie. Just taking a look at them all together and one can remark on the huge variety in ‘offers’. It seems the general trend is to demand the purchase of 9 hot drinks, and in return, 1 drink is ‘free’. Beware though! You look more closely and your G&D’s card states that the Holy Cow and Mad Cow drinks aren’t included as redeemable beverages. 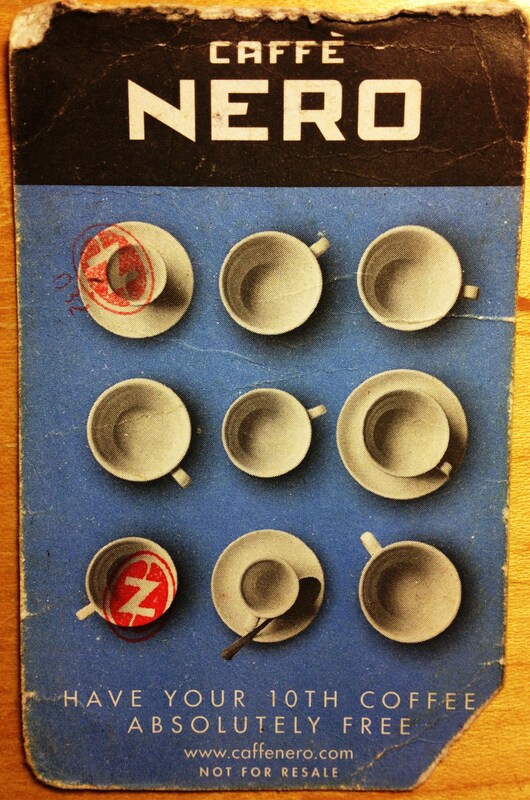 As it lies there pathetically, you realise your flimsy Caffe Nero card probably won’t even survive the time it takes to consume 9 drinks. Thankfully, Java & Co. and Taylors adopt simpler policies; there’s no small print on those. The Missing Bean pips most of the others to the post: you need only buy 8 drinks to get your ‘free’ drink there! 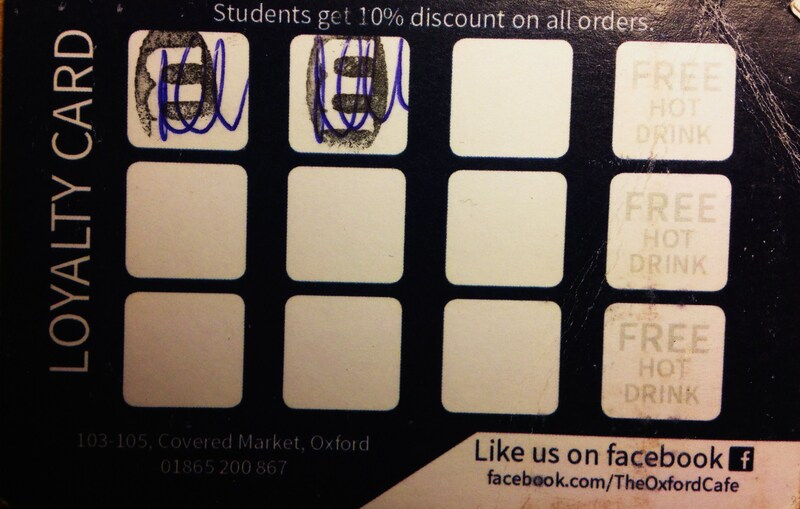 The Oxford Café wipes the floor though, offering a ‘free’ drink after every 3 drinks you buy! Incredible! Congratulations, you now have a better idea of which cards to pick, and with which cafes it’s most advisable to stand firm in the faith. But just keep reading a little longer. It’s not that simple. Go to The Oxford Café by all means, but we all know no one does. The drinks are that much more expensive anyway. 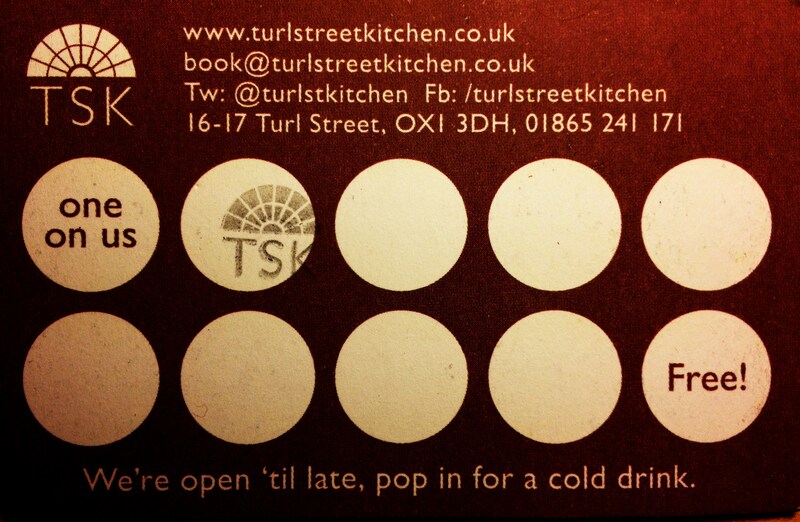 Meanwhile, the Turl Street Kitchen are having an absolute joke. Take a look at their loyalty card and one finds the first blank circle pre-stamped with ‘one on us’ – even before you’ve bought your first drink! 8 stamps later and you get your ‘free’ drink. Do we honestly feel that we’re really already on our way to that desired freebie when we pick up the card? The proliferation of loyalty cards and their ‘free’ hot drinks is surely not a collective act of benevolence on the part of our coffee industry. As my father always used to say to me, “Son, nothing in this world is free.” And indeed, I think that was he on to something. With the gradual inflation of prices, it’s hard for anyone but the savviest of coffee-drinkers to keep a beady eye on rising prices, but might it just be possible that these cafes simply raise the price by that ~10% to make up the deficit of the ‘free’ drink? Might this system simply be a way of yoking customers to shops by no means other than an ironic contradiction of our capitalist economy? Would I prefer to save on the added weight and thickness of my wallet whilst paying for coffee that costs 10% less and doesn’t trap me in a vicious circle of daily frequentation of the same shops? 3 x filter coffee at £1.70 + 1 ‘free’ drink = £5.10. Compare with Pret: 4 x filter coffee at 99p = £3.96. Ultimately, the loyalty card phenomenon is not what it claims to be. This twisted notion of ‘loyalty’ is far removed from the purer forms of familial or amicable allegiance with which we might more readily associate this word. The truth is that loyalty schemes not only encourage increased consumption in the first place, increasing the overall money we spend on drinks, but what is more, rather than forging any meaningful bond between vendor and buyer on the basis of trust and appreciation, it rather forces the buyer into a situation of accrued economic deficit wherein enforced fidelity is the only way to recoup a portion of what is actually forfeited through our adherence to this duplicitous and meaningless scheme. So collect your cards, and ink your way to financial gain. But just remember, as you extend your arm like one too too cruelly trapped in some merciless vice, you’d probably be better off at Pret. Agree everything you wrote. I just started to blog and this was my first topic 🙂 l found yours on Google. When I searched “coffee shop loyalty cards” you appeared on page 1. Well done!